As you read these words, the Information Age explodes...inside and around you...with the Misinformation Missiles and Propaganda bombs of outright Information Warfare (NO, English “pro-situ” zine). “Information" is chaos; knowledge is the spontaneous ordering of that chaos; freedom is the surfing of the wave of that spontaneity (Hakim Bey, The Information War). Chomsky has denounced disinformation as the “manufacture of consent.” In an indoctrinated society, he argues, it is crucial to “prevent understanding,” to “divert attention” and to “conceal what it is happening before our eyes,” so that the elite groups, meaning the state and corporate powers, can act without public constraints to achieve their goals in the name of “national interest.”5 In a democratic society, unlike a dictatorial regime where control is exercised through violence, it is necessary to control not only what people do but what they think. Not submitted yet to the interests of corporate media, the Internet has arguably been regarded as a truly democratic instrument for the dissemination of alternative information. However, free access to the Internet and the ubiquitous nature of cyberspace have come to represent a threat as well. The “information bombs” or “the weapons of mass disruption”6 threaten to attack communication systems bringing financial and military instability by making it impossible to differentiate between information and disinformation. This demonizing of information puts at risk the freedom of the Internet with a new security paradigm as measures of control are being considered. The first World Summit on the Information Society (WSIS), held by the United Nations in 2003, talked about the digital divide, knowledge dissemination, social interaction, political engagement, media, education, and health. Yet according to alternative groups, it was used to mystify the continuing use of information to protect and advance the interests of global capital. Artists, activists, grassroots media and hacker collectives have emerged to bring awareness and transparency to the control of information flows. They deploy an array of different tactics (satire, documentary exposé, fictionalization of news, simulation, disruption) and media (installation, poster, video, radio or internet.art) to demand freedom of information, and bring forward omitted information. Capitalizing on the ubiquitous nature of cyberspace and its disguising power, The Yes Men take on an act of radical travesty by cloning scrupulously the marketing jargon of corporations. In the Dow Chemical Identity Correction, BBC World Service, 2004, The Yes Men faithfully copied the pharmaceutical company’s website, subtley changing its content. The controversy arose by the fooled visitors entering the fake website. The BBC broke the news and set off worldwide exposure, damaging Dow’s stock market. Relying on similar cybertactics, the Italian collective 0100101110101101.org (Eva and Franco Mattes) stirred a great deal of confusion and controversy when in September of 2003 news went out nationwide that Karlsplatz, one of Vienna’s main squares, was soon to be renamed “Nikeplatz.” The guerrilla campaign was announced through a plagiarized version of Nike’s website (www.nikeground.com) proving in a reverse of fortune that the more corporations rely on media the greater their vulnerability. These artists use tactical media to expose its mechanisms. In the format of the left documentary exposé, Marcelo Exposito’s Radical Imagination (Carnivals of Resistance), 2004, presents an alternative view from those opposing the turn of global capital, that is often omitted or falls in the interstices of mass media. Paul Chan’s The Question of Democracy is an extremely complicated one, 2005, poses a criticism on the careless slogan use of democracy by which the US administration has built its campaign on the war on terror. Chan’s gesture of bringing to light a peculiar text, Saddam Hussein’s speech on the subject of democracy dated 1977, cries out for its paradoxical oddity and poses a more complex reflection on the current political and ideological state of the concept of democracy. Martha Rosler’s If It’s Too Bad to be True, It Could Be DISINFORMATION, 1985 - the exhibition’s homonymous title -serves as the framework for the exhibition. Still under the backdrop of Cold War politics and a pre-Internet technological era (in which information relied on TV, radio or newspapers, had less volume, and was more localized), Rosler’s work resonates with a renewed dualist rhetoric (of us and the enemy, good and evil) and is a precursor of the tactics of deconstruction of news widely deployed today, vividly showing the currency and common practice of disinformation in today’s media. In an attempt to bypass and subvert the mass media, a number of indymedia collectives have sprung with a common belief in what Charles Esche has called the “modest proposal,” and claimed their right to exercise free expression.8 The collective neuroTransmitter has rekindled the power of the mini-FM. Using a portable radio broadcast unit last year during New York’s Republican National Convention, neuroTransmitter ‘mini-cast’ in the streets of Times Square, where the top media corporations have their headquarter offices. They provided information on the media’s corporate partnerships in an attempt to bring to the attention of passersby the legitimacy of their biased news. In Frequency Allocations (in 3 parts), 2005, neuroTransmitter explores and exposes the Federal government’s control and regulation of the airwaves and questions the recent Federal licensing of Lower Power FM. A poster and handouts show how to produce DIY radio within and outside the federally established limitations and illustrate the possibilities of tactical frequency jamming. 1. Title of Martha Rosler’s work shown at the exhibition Disinformationcurated by Gino Rodriguez at The Alternative Museum in New York in 1985 (and in this exhibition). 2. Hakim Bey, The Information War, published online by CTHEORY texts. 3. Paul Virilio, “The Media Complex,” The Art of the Motor, (Minneapolis: University of Minnesota Press, 1995), p.1. 5. Noam Chomsky, “Disinformation”, Disinformation (New York: The Alternative Museum, 1985) pp. 11-18. 6. Paul Virilio, The Information Bomb (London: Verso, 2000). 7. David Thorne in an email exchange, August 24, 2005. 8. Charles Esche introduces the concept of “modest proposal” as one that articulates around “what might be, rather than what is.” Essentially speculative in the sense that a modest proposal imagines how things could be other than what they are and relying on creativity, it is also very concrete and actual in order to deal with real existing conditions and what might be necessary to change them. This concrete necessity is what gives it the term “modest.” They depart from existing conditions and are aspirational and purposeful in nature. 9. Jean Baudrillard, “Rise Of The Void Towards The Periphery” published online by CTHEORY texts, translation by Charles Dudas, York University. Originally published in French as part of Jean Baudrillard, L’Illusion de la fin: ou La greve des evenements (Paris: Galilee, 1992). 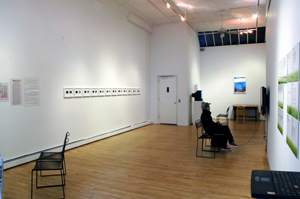 apexart's exhibitions and public programs are supported in part by The Peter Norton Family Foundation, Altria Group, Inc., and with public funds from the New York Department of Cultural Affairs, and the New York State Council on the Arts through the Fund for Creative Communities, administered by the Lower Manhattan Cultural Council. This exhibition received support from the LEF Foundation.